Do try this perfect breakfast side dish when you need something very comforting but uncomplicated. 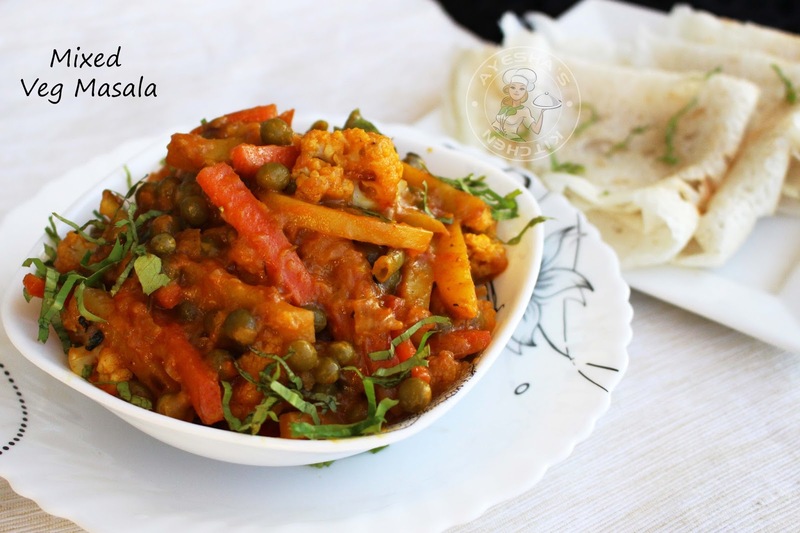 This stir fried creamy side dish / veg curry pairs best with Indian dosa, Chapati, Flat bread etc. As i told you, morning breakfast food is the difficult task for me as always. I do love quick and simple brunch items, but my hubby won't. It is very easy to whip up a delicious side dish or gravy with chicken but it is impossible with a veggie side dish. The chopping and dicing of veggies makes me to stay away from this veggie breakfast meal. But these days i set those veggies needed for the next day morning ready, ahead of time like the night before. So that i can dump those veggies and spices together in a crock pot or slow cooker. Seems less mess , right? But now a days this too bored me. Especially on Friday morning, which is considered as the day of celebration for middle eastern people. As am residing in UAE, i need something simple but delicious breakfast. As morning breakfast is the one which decides the entire mood of the day, i admired the new style in cooking. The sweet and toasty flavor of roasted veggies can get boring after a while. Do try this twist with Indian spices. An intensely colorful with exotic flavors and aroma, you do not have to convince your kids to have this delicious morning treat. 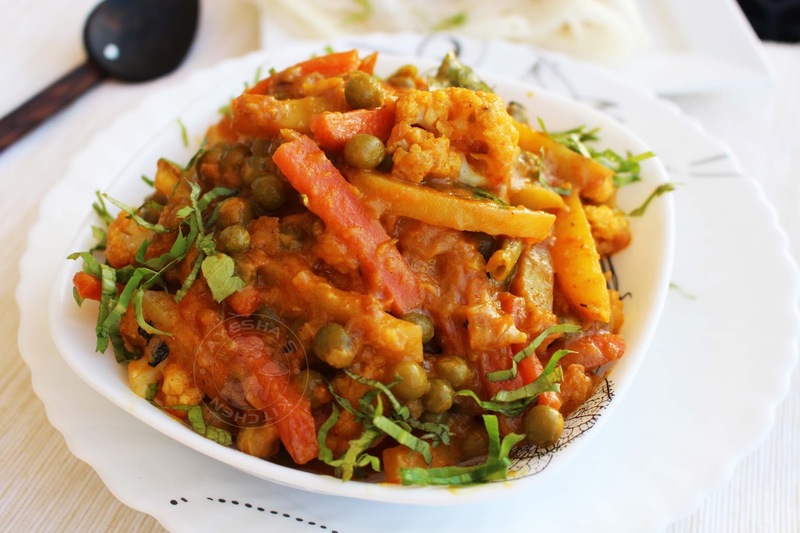 So give this Indian vegetable curry recipe a try. Lets see how to make yummy breakfast sides / veggie sides / simple easy breakfast ideas/ stir fry vegetables recipe / vegan stir fry recipes. Enjoy. Wash and soak the green peas in water for 4 hours or over night. Or you can use frozen peas instead. Drain it and set aside. Heat oil in a pressure cooker and saute the finely sliced onion until soft. Meanwhile, grind together roughly chopped tomato, fennel seed, and garlic cloves. When the onion is done, add this tomato- garlic mixture to it and saute for a while. Then add the spice powders and give a fine mix. Let it cook for 2 minutes over a low flame. To this, add the soaked and drained green peas. Combine it well with the onion tomato gravy. Add 1 cup of water along with some salt and then pressure cook it for 3 whistles (it may depend upon the green peas used). If you are using the frozen peas, skip this step and add them finally along with other veggies. Let it cook. Meanwhile, we can sautee other veggies. For that, heat a pan and add 2 teaspoons of melted butter (can add oil instead). Toss the thinly sliced potato for 3 minutes and then followed by other veggies. Saute and let them cook with lid closed for other 3 minutes over a medium low flame. When done set aside. 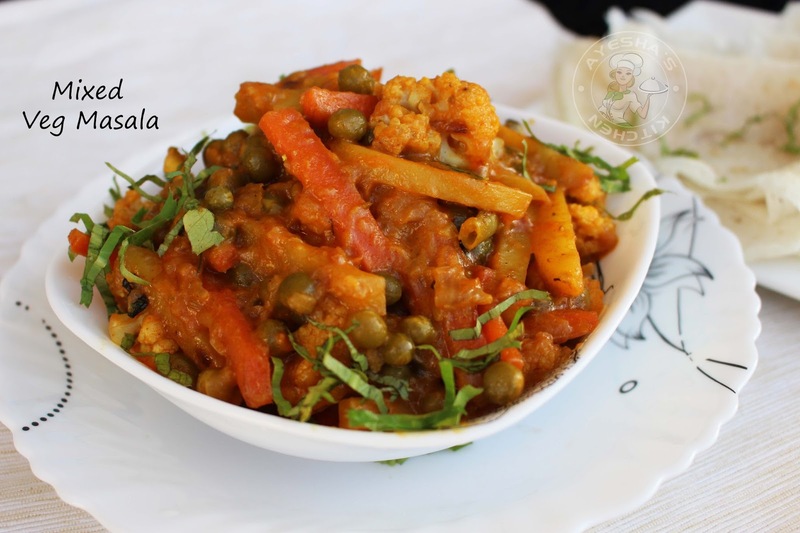 Now add this sauteed veggies to the prepared peas gravy. Combine it very well. Check for salt. Add half a cup of milk / fresh cream. Let it cook until the gravy thickens. Finally, add some curry leaves and crushed Kasuri methi/fenugreek leaves and mix well. Remove from flame and serve hot along with chapati/dosa / steamed rice.